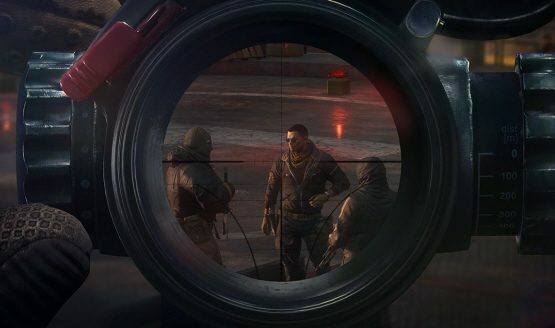 The Sniper: Ghost Warrior series of games has not seen the best of critical success. However, since Sniper: Ghost Warrior 2 was deemed a commercial success, capitalism dictates that there should be another entry in the franchise. Polish developer Ci Games isn’t content with simply coming up with a new story and releasing a basic sequel: they are attempting to make everything bigger and badder, while giving players more choices in how they want to tackle missions. We went hands-on with the game while at Sony’s PlayStation Experience 2016 event, and have a preview ready for you. Ci Games wanted to make it clear that while this is at its core a sniping game, you are given a more complete arsenal of weapons, and can complete missions any way that you desire. You can also craft weapons and swap bullet types. In the demo we played, for instance, explosive rounds were used to knock down a tree, creating an impromptu bridge to cross. While you will also have rifles and pistols at your disposal, the game is realistic in bullet damage, and thus running-and-gunning is rarely a viable strategy. Besides, with detailed sniper rifles including scope adjustments for distance, your surest shots will be taken with the long barrel. Sniper: Ghost Warrior 3 utilizes the CryEngine 3, which probably helps to make the game simply look much better than the last entry in the series. However, the game had a noticeably low frame rate during our time with it. A Ci Games rep told us that it was in an early stage of technical development, though all story missions have been fleshed out at this point. So, we’ll give the sub-par frame rate a pass…for now, at least. Speaking of story missions, since Sniper: Ghost Warrior 3 is open-world, you are free to discover and complete missions in basically any order that you wish. It is on you to do reconnaissance with regards to targets that you are given. While the game doesn’t point out enemies for you automatically, you do have a couple of new tools at your disposal to help you. First, there is the portable drone, which you can use to not only scout out an area, but also to tag enemies. You have to beware, however, that enemies can hear and see the drone, and will enter a heightened state of alertness if they spot it. Second, your character, retired American Marine Jonathan North, can use a special Scout Mode vision, where nearby ledges and sniping points are highlighted to help you navigate some of the game’s more difficult terrain. Depending on your playstyle, you will receive points at the end of a mission in three different categories, depending on how often (if at all) you were detected by enemies, how clean your sniper shots were, or how gung-ho you approached the mission. The scoring system doesn’t seem to penalize any single playstyle worse than others, though if you play like a “Warrior,” meaning more trigger-happy, you are likely to be spotted more frequently, and thus will probably receive fewer points than with other methods of playing. There are going to be a few different maps that you are placed in at certain parts of the story, and each promise to encompass several square kilometers of open-world sandboxes for you to play in. We only saw a small slice of one level, and it was certainly very large and intricately-designed. The player makes camp at various safe houses, from where you can craft weapons, ammo, and other items, as well as progress time, since certain events only occur at certain times of day, making your targets easier or harder to kill. Ci Games’ new approach to a sniper game feels promising. With a ton of options at the player’s disposal, replaying missions to attempt completely different strategies is likely to entice many gamers. The open-world nature of the game may turn a few insistent fans of the series off, but it can be generally taken to be a good thing. Sniper: Ghost Warrior 3 is currently set for release on April 4, 2017 for the PS4, Xbox One, and PC.